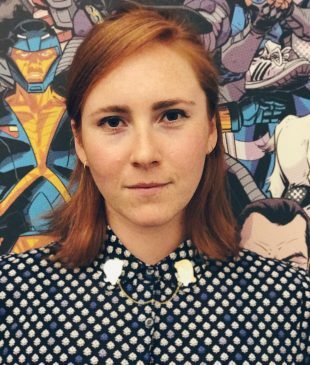 Valiant Entertainment is proud to announce that Charlotte Greenbaum has been named to the position of Associate Editor. Greenbaum begins her new role in the midst of Valiant’s “ICONS”initiative with a slate of major new ongoing series, prestige-format limited series, and self-contained events planned for the publisher’s most storied characters, including X-O Manowar, Bloodshot, Faith, Ninjak, and more. As Associate Editor, Greenbaum will assist Valiant Editor-in-Chief Warren Simonsin the upcoming launch of NINJA-K #1 from writer Christos Gage (Netflix’s Daredevil) and artist Tomas Giorello (X-O MANOWAR) in November. Additionally, Greenbaum will assist on an ongoing basis on leading Valiant titles including X-O MANOWAR (2017) by writer Matt Kindt (ETERNITY, Mind MGMT) and artist Clayton Crain (RAI, Carnage) and SECRET WEAPONS by Academy Award-nominated screenwriter Eric Heisserer (ARRIVAL) and Harvey Award-nominated artists Raul Allen (WRATH OF THE ETERNAL WARRIOR) and Patricia Martin (BLOODSHOT REBORN). Greenbaum joins Valiant at an auspicious time for the rapidly expanding publisher. In March, Valiant celebrated the debut of X-O MANOWAR (2017) #1 by writer Matt Kindt and artist Tomas Giorello as the year’s single highest-selling comic book from any independent publisher, only to follow it in June with SECRET WEAPONS #1 – the year’s highest selling debut of a limited series from any independent publisher. After securing several 2017 Eisner Award nominations for series including Jody Houser’s FAITH and Jeff Lemire’s BLOODSHOT REBORN, Valiant will launch several more high-profile series in quick succession over the following months, including BLOODSHOT SALVATION #1 by writer Jeff Lemire and artists Lewis LaRosa & Mico Suayan in September; NINJA-K #1 by writer Christos Gage and artist Tomas Giorello in November; and QUANTUM AND WOODY! (2017) #1 by writer Daniel Kibblesmith and artist Kano in December. Then, in May 2018, Valiant will unveil its most impactful and ambitious comic book event to date with HARBINGER WARS 2 by writers Matt Kindt & Eric Heissererand artists Tomas Giorello & Raul Allen. Greenbaum is just the latest addition to Valiant’s growing editorial stable, which, in addition to Simons, also includes Associate Editor Danny Khazem, and Assistant Editors Benjamin Peterson and David Menchel. Her prior experience includes Double Take Entertainment, where she served as Associate Editor. She holds a B.F.A. from Washington University in St. Louis.